When I was in high school, I was on the swim team. My high school had one of the best swim teams in the region. But I was one of the worst swimmers on the team. Of course, I didn’t like being one of the worst. (I also was one of the worst on my baseball and soccer teams.) Being one of the worst wasn't easy from a psychological standpoint. I had been raised with middle class Midwestern values of the time like, "Work hard and you will get ahead", and "Play to win." I wanted to be a winner. And individual sports like swimming can be psychologically challenging. My coach said that I needed to work on my physical endurance. But I also needed to learn how to keep my head in the game. During practices, I didn’t know how to pace myself. So, I would try to keep on the toes of the swimmer in front of me. I would swim at their speed for a few laps, and then I would be winded. I would start cheating on my turns. Then, I would skip a fifty and rest at the wall. It was impossible to keep up the pace that was needed. If only I had learned to swim at my own pace. And that the most important thing was to keep going, no matter what. It was no use worrying about how fast other people were. I had to accept that I might not have time to rest at the wall between sets. So what if I got lapped? When it got hard, I just needed to keep going. Unfortunately, these things never sunk in. I was in good physical shape, but I continued to psych myself out. In my 20s, I discovered aerobics and yoga. I learned how to pay more attention to my body, and how to pace myself better. I challenged myself by trying to make the second half of my workout harder than the first half, just like we were told to in swim team practice. But I also learned how to keep going, even when it was tough. And I made sure to reward myself, by taking my time during cool down. Writing is a psychological sport, too. I don’t want to post on my blog every day for Nablopomo (National Blog Posting Month). But I’m going to try to keep it going. Even when it’s tough. A good lesson for us all, learning to go through life at our own pace. I was always the worst player at sports when I was younger, but I find am able to do better the older I get. Maybe everyone else is getting slower and going at my pace! I can understand your younger self having the desire without the direction. The fact that you are still young and have learned so many lessons and are pacing yourself better now is great. I for one only write a post when I feel like it. I don't want to be signed up to a system that I have to produce a post at a certain time. I can't do that. But then, I was not involved in any sports team or activity in school either. I played baseball growing up but outside of school. TechnoBabe, will you enable your e-mail? I often reply to comments via e-mail. I usually only post on my blog when I feel like it, too. But I'm participating in Nablopomo (National Blog Posting Month) as a personal challenge, you know, to exercise my writing muscle. And can I do it? It's getting more and more challenging to publish a post. Stay tuned! Juli, is that a picture of you? Makes my heart ache. Just want to fix the angst of that little girl. Yeah, I grew up in that town to and not being the football, basketball, baseball any ball star I can totally relate. Pacing is hard. Glad you have got the hang of it. Keep it up. Pacing myself has been one of my biggest challenges in nearly every aspect of my life. You seem to be doing fine even if the going is tough. Hi Juli - thanks for the comment on my blog and follow! I'm loving your blog! I'm planning on doing NaBloPoMo in November ... I'm already doing the mental prep. 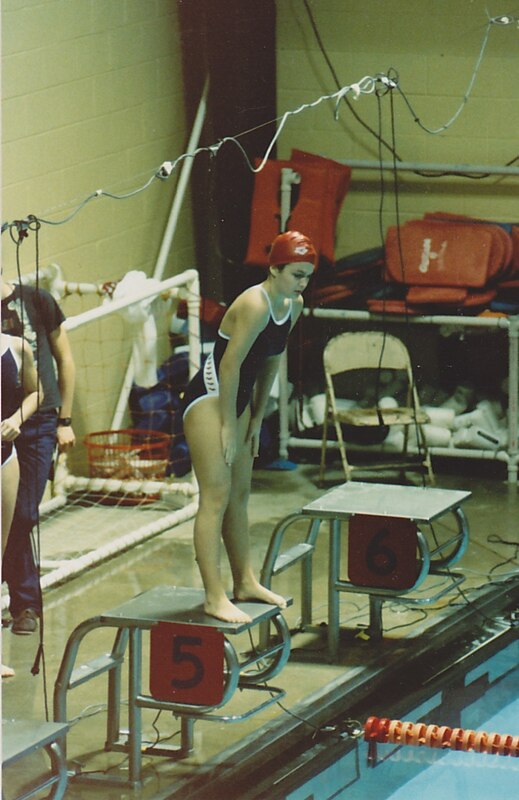 I was the worst swimmer, too!